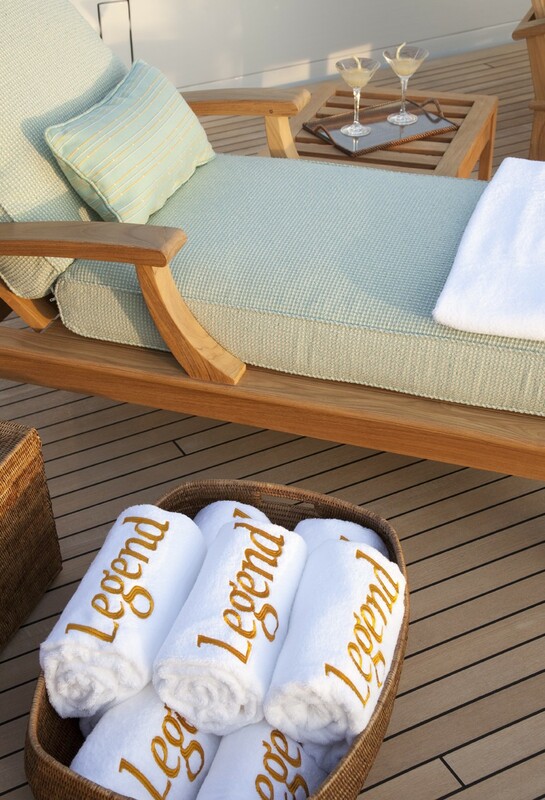 LEGEND (ex JAMAICA BAY) has classic lines with a beautiful canoe stern, smooth operating machinery, a lovely sundeck and a formidable profile. 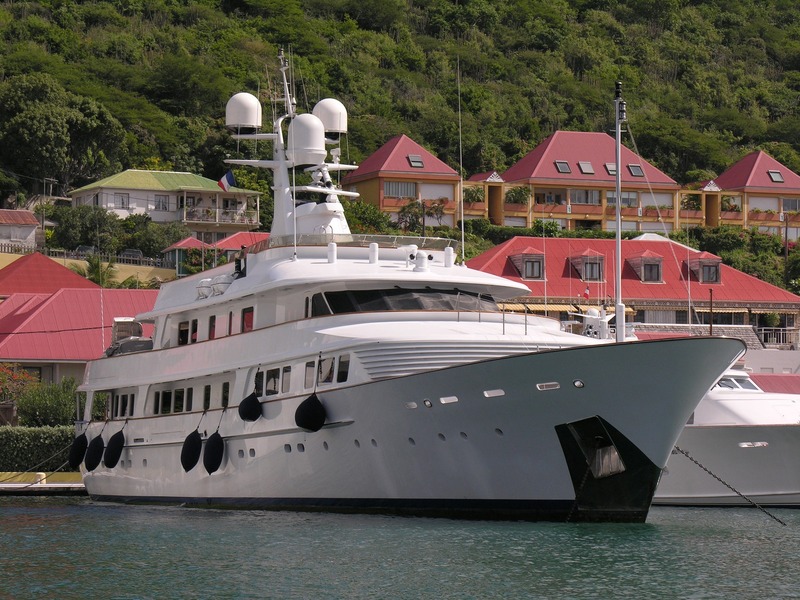 Having a traditional steel type hull, she offers great stability to ensure elegant and comfortable cruising on your luxury charter vacation. 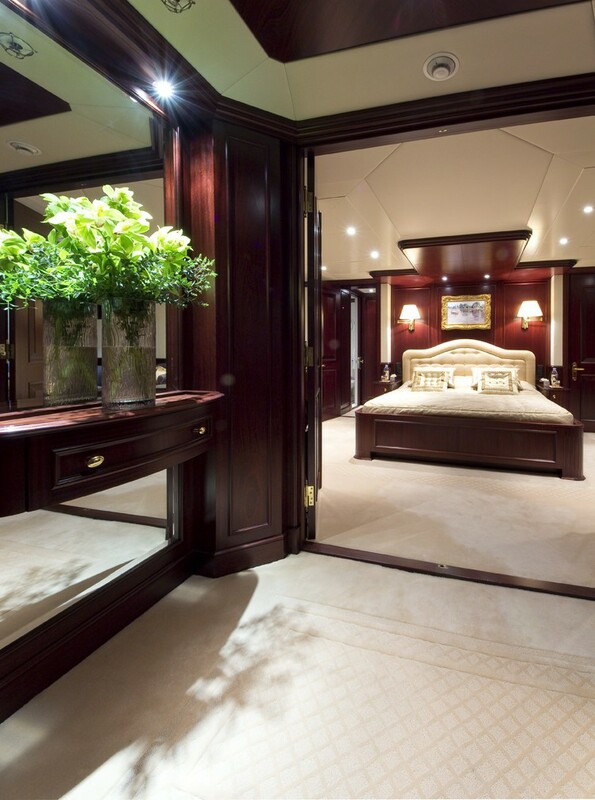 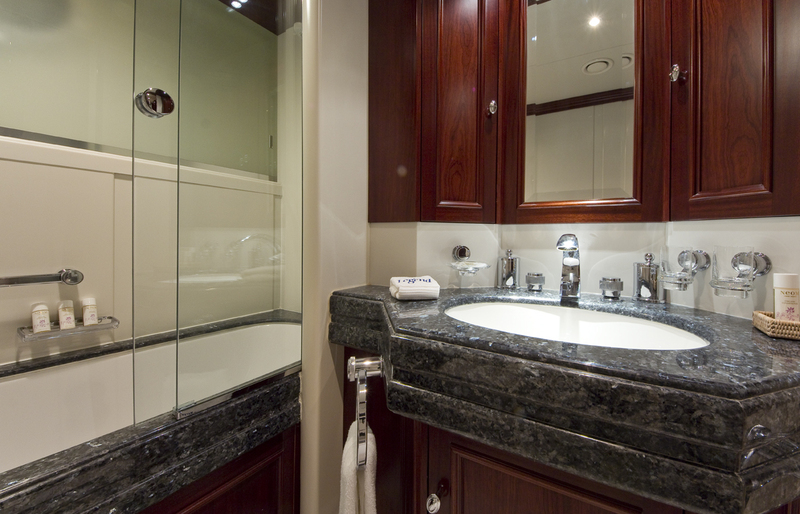 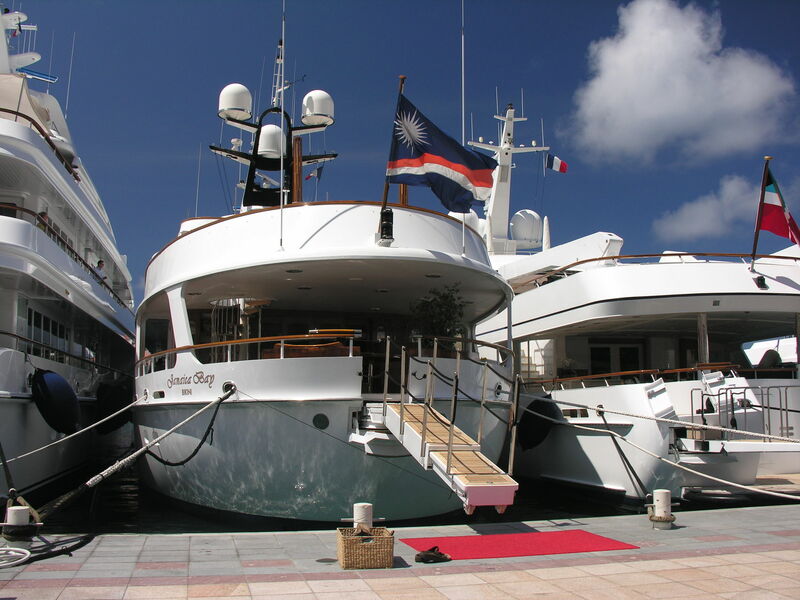 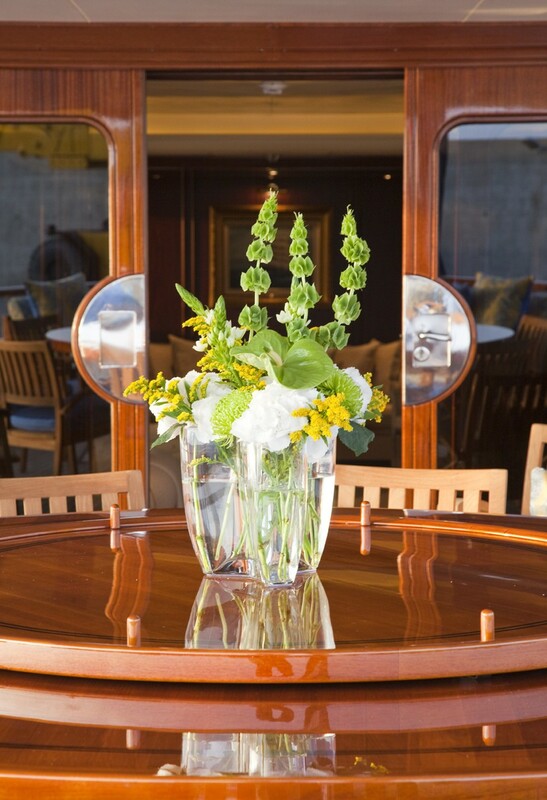 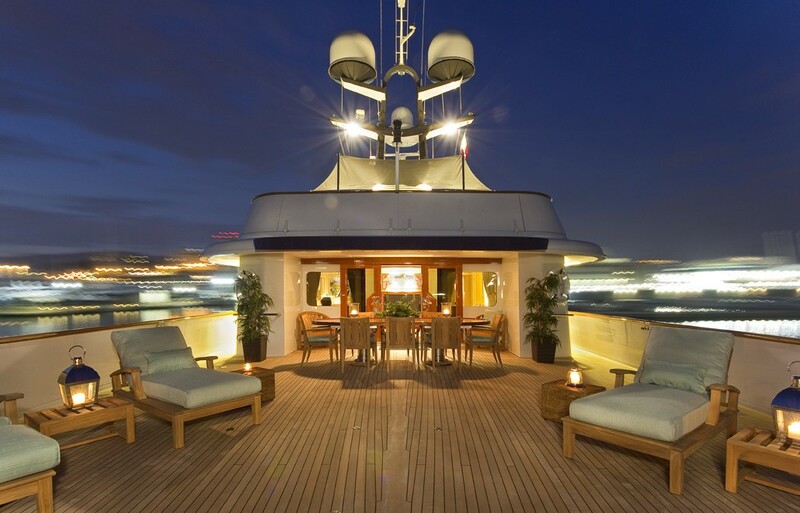 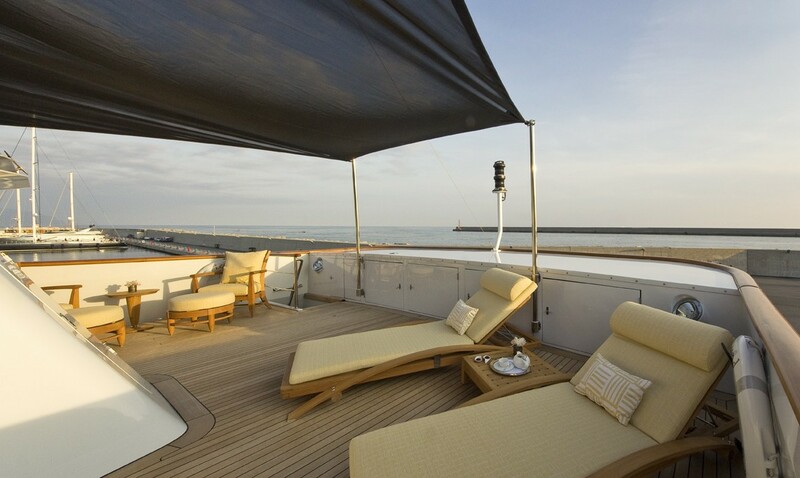 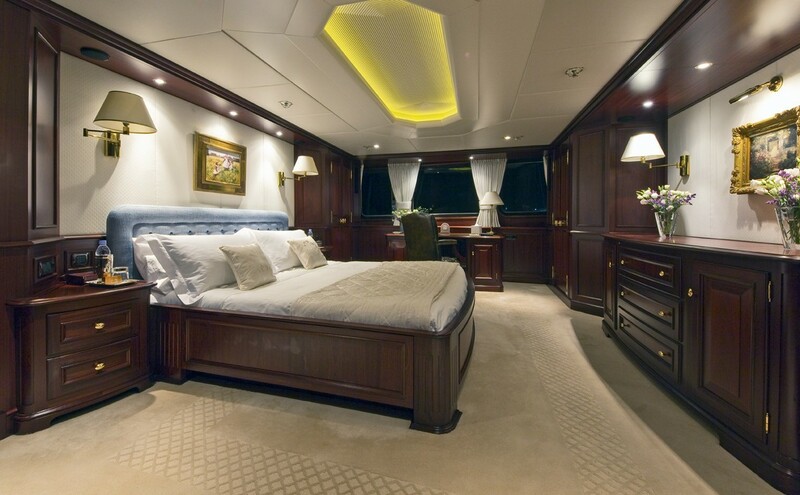 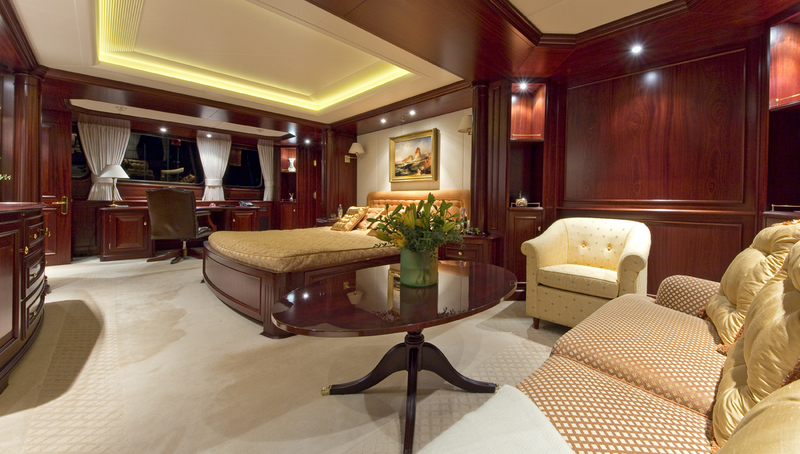 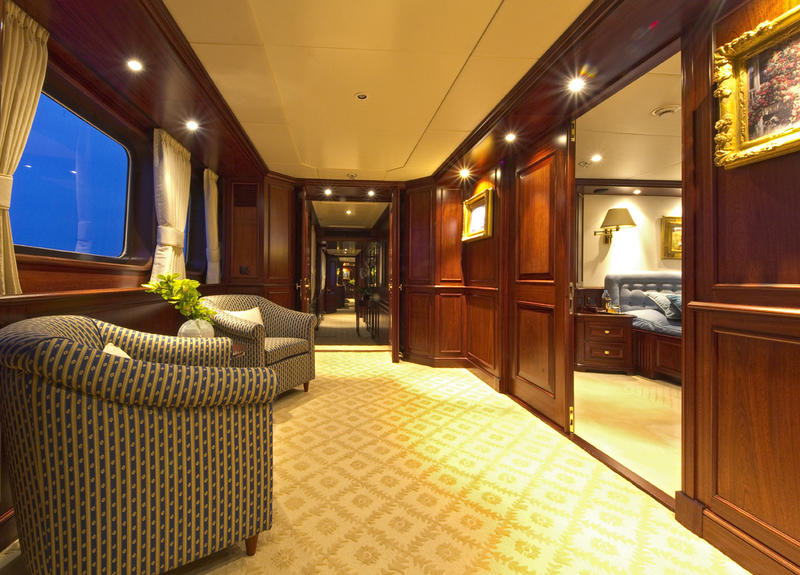 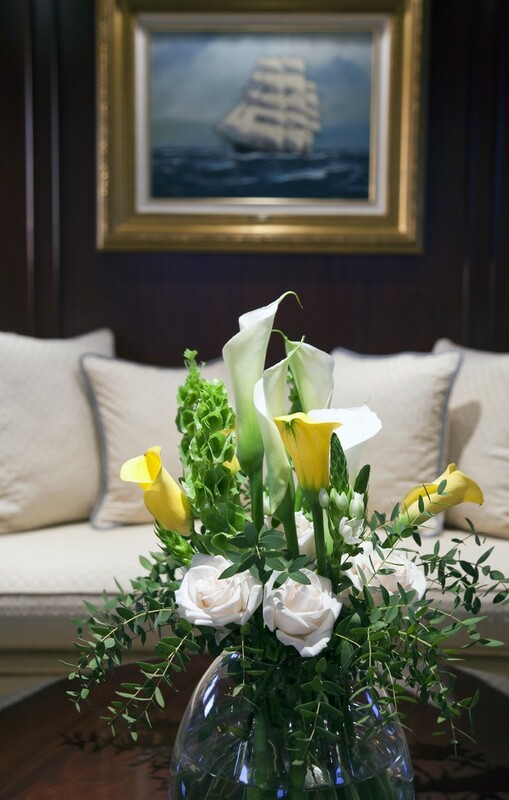 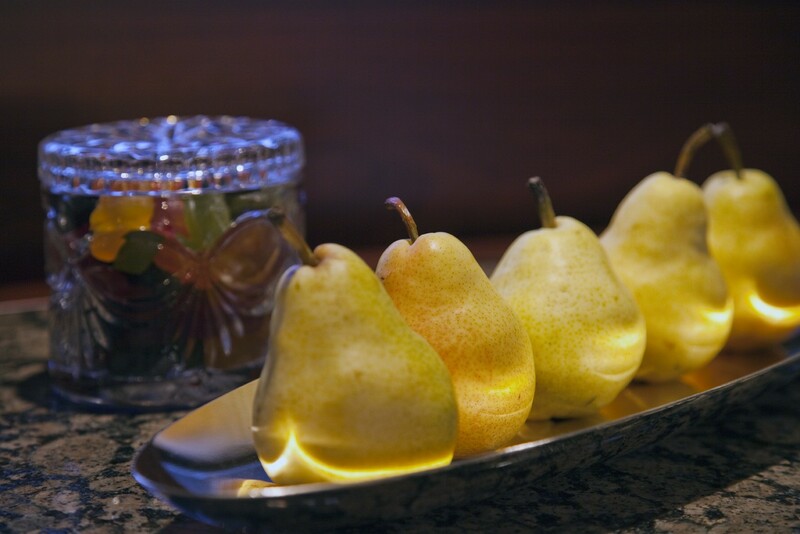 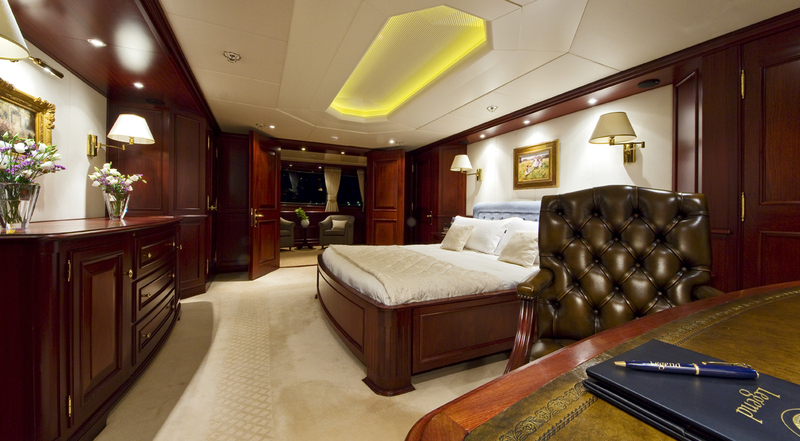 The yacht can accommodate 12 guests in 6 cabins with 4 Double and 2 Twin beds. 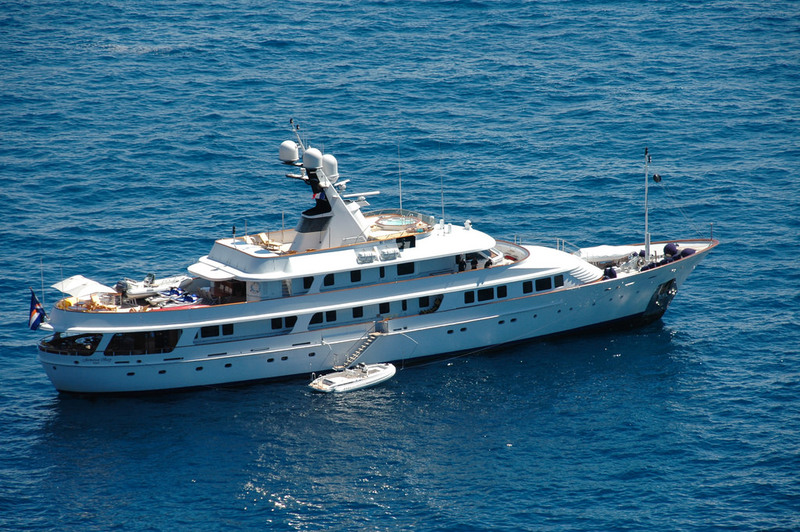 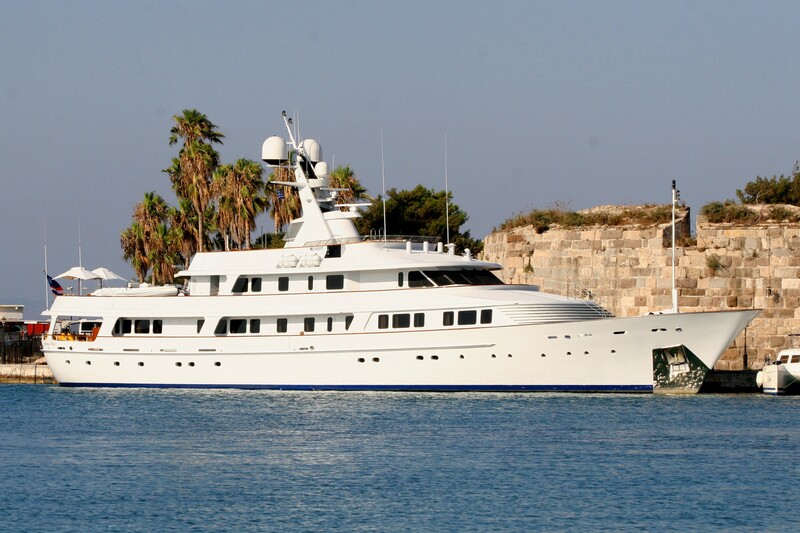 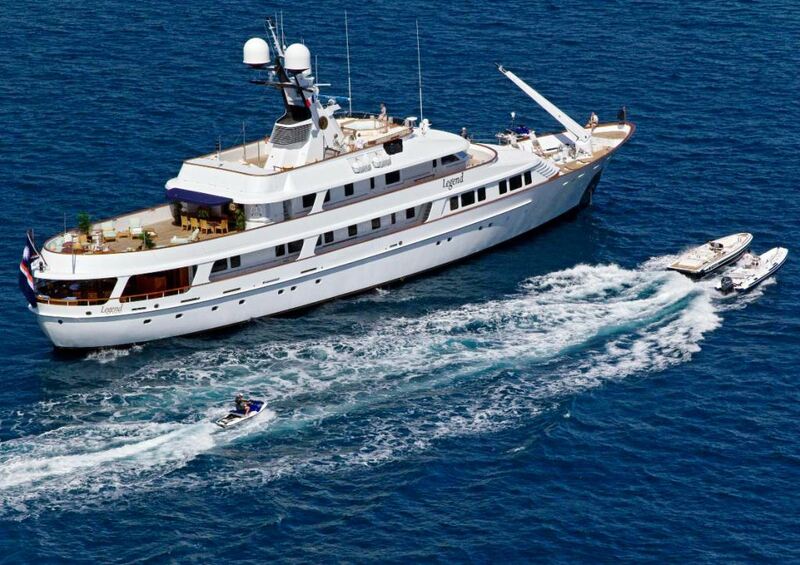 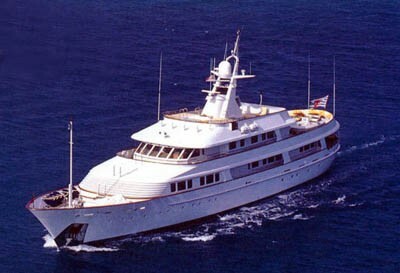 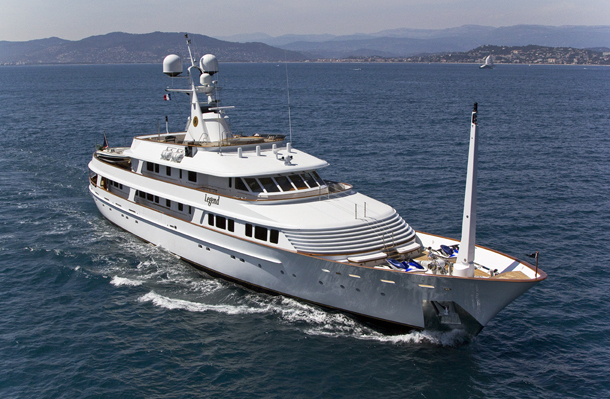 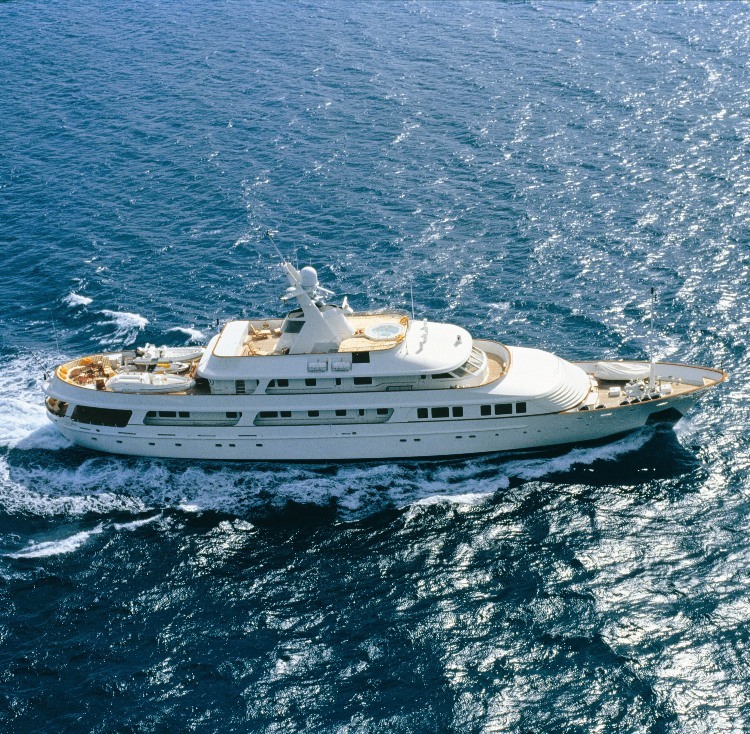 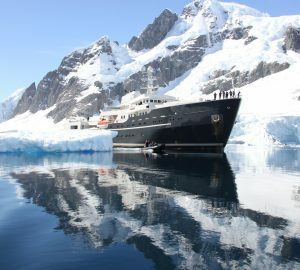 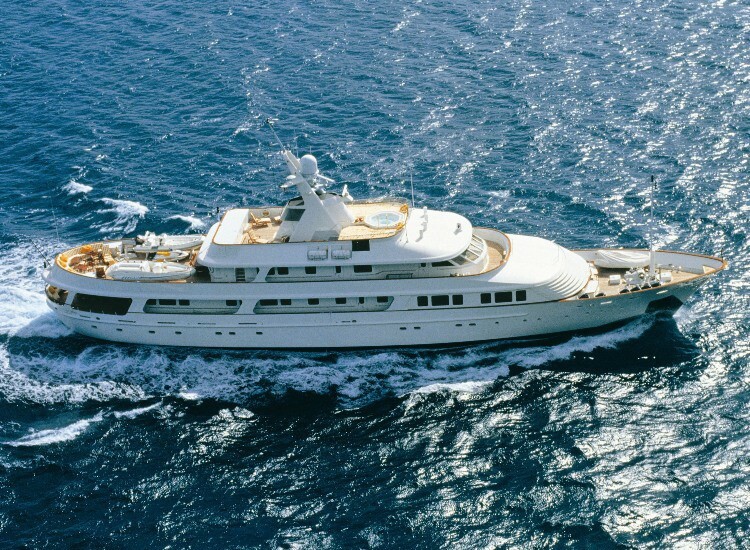 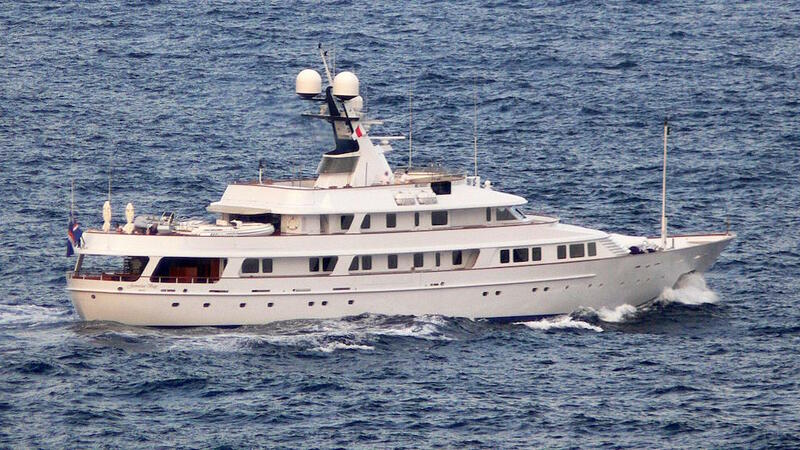 Being quite large at 51.25m (168' ft) in length and having been refitted in 2010 she offers very good value. 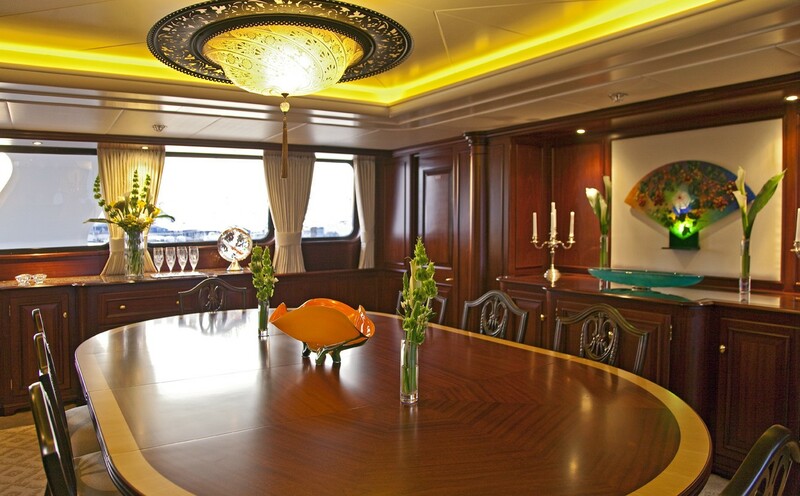 She features an extremely inviting interior of classic mahogany paneling, French and English furniture, superb fabrics, silver, china and crystalwear. 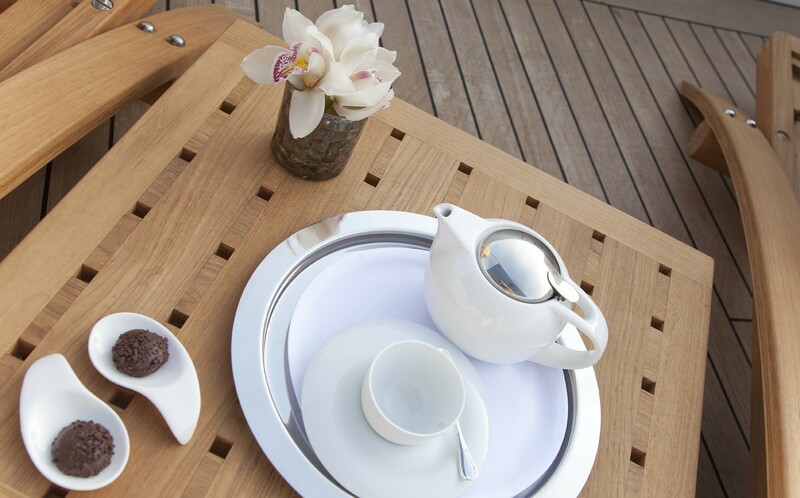 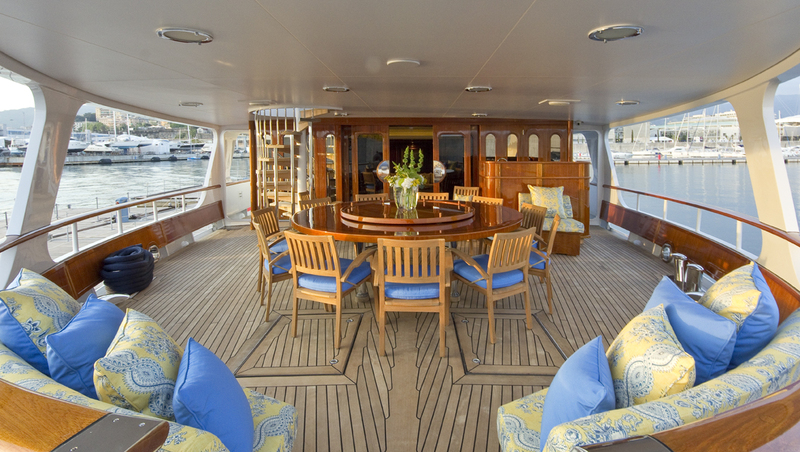 The airy deck spaces accommodate dining on two different levels. 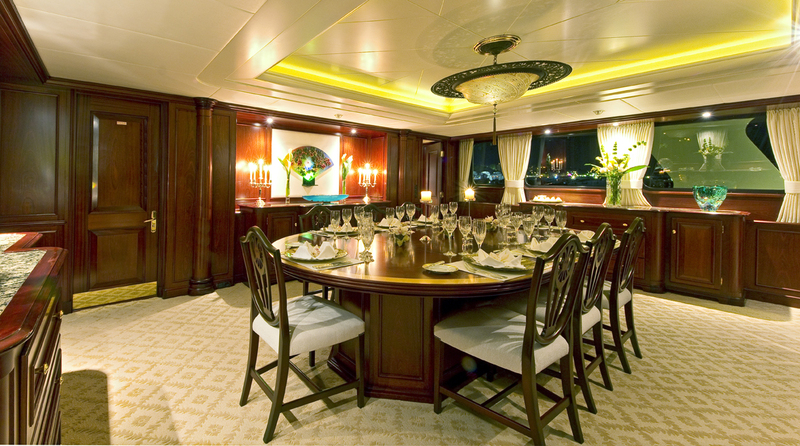 The elegant and large dining area with oval mahogany table comfortably seats twelve. 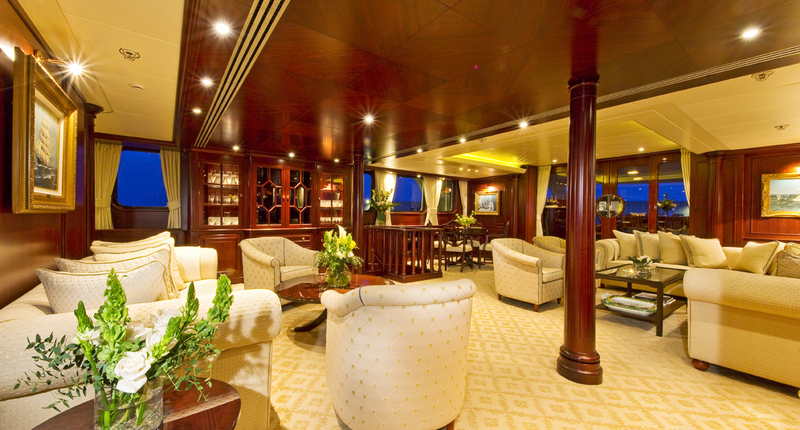 Adjacent to the dining area is the main saloon which is furnished in pale fabrics, contrasting attractively with the dark wood detail. 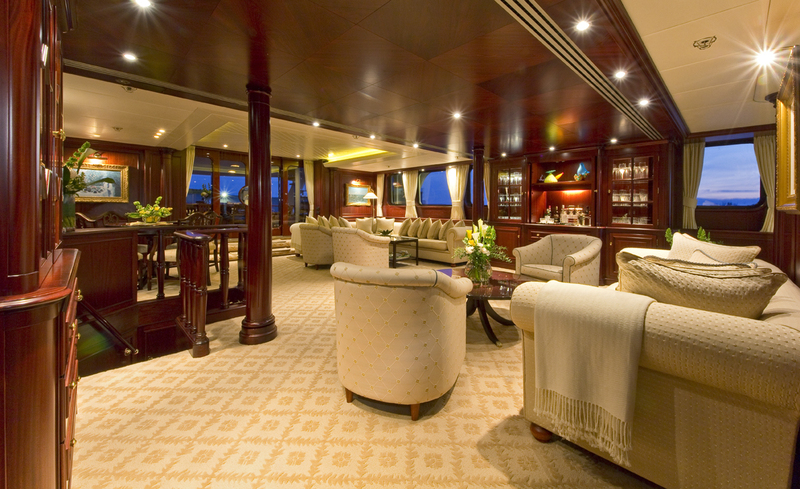 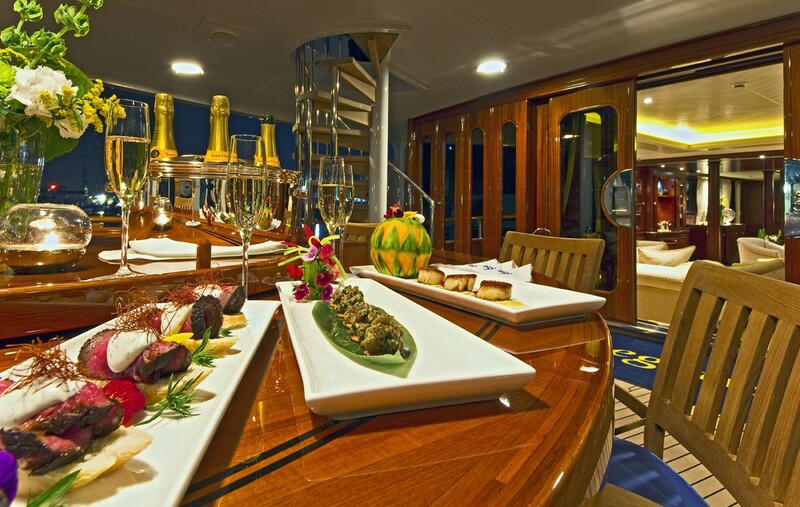 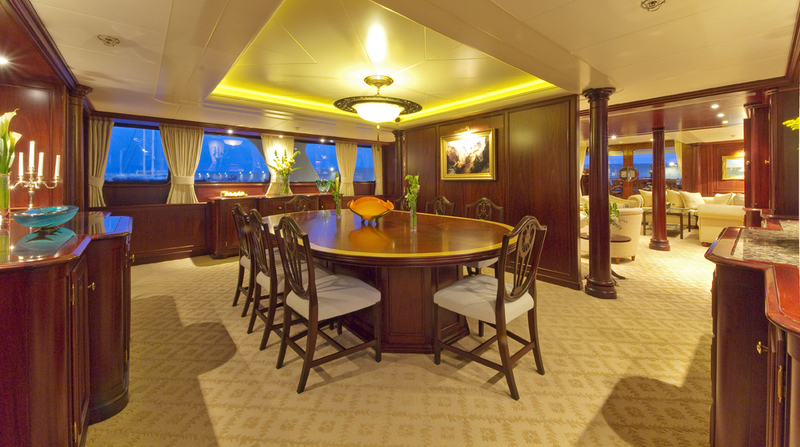 The large aft deck has an ample dining area. 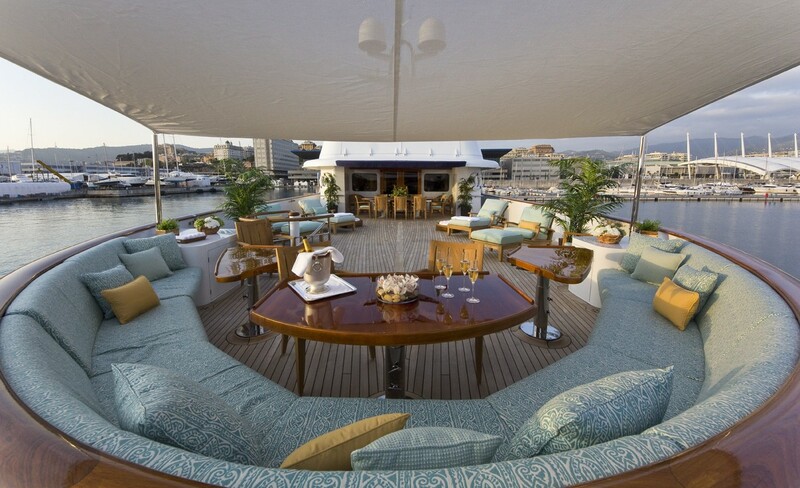 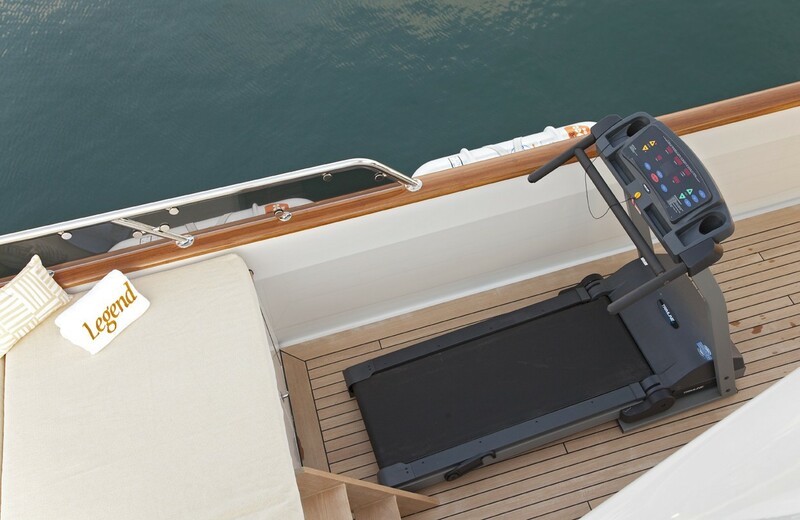 A Sky lounge with gym equipment and lounging area leads to the boat deck with lounging and dining areas, and the top deck with a large deck Spa Pool. 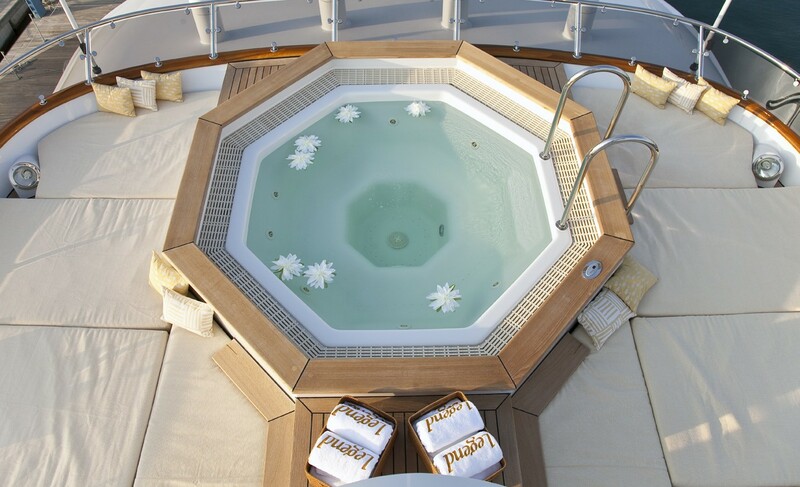 She provides good exterior deck space and sunning areas and on her the third deck she offers a large and well-appointed sundeck along with a great hot tub Spa Pool. 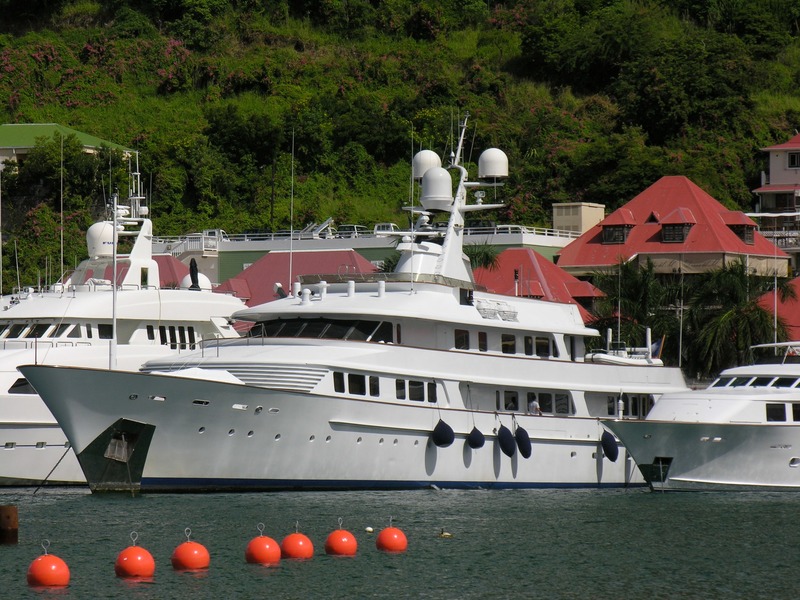 There is also a nice assortment of tenders and water sports toys to utilize. 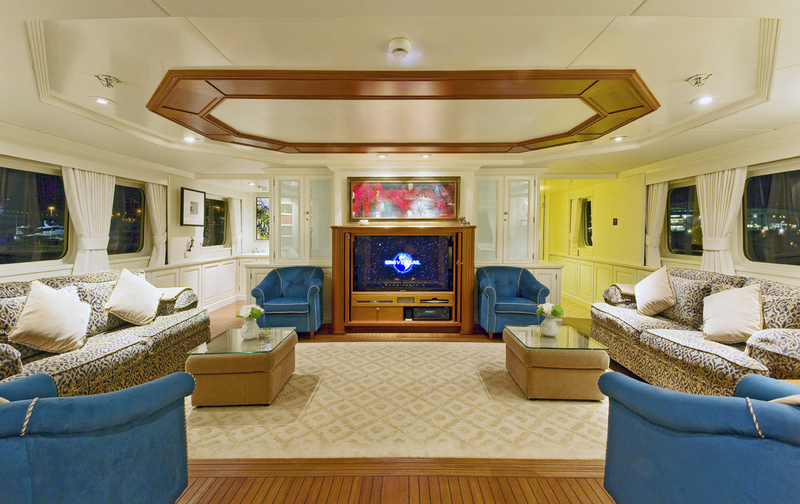 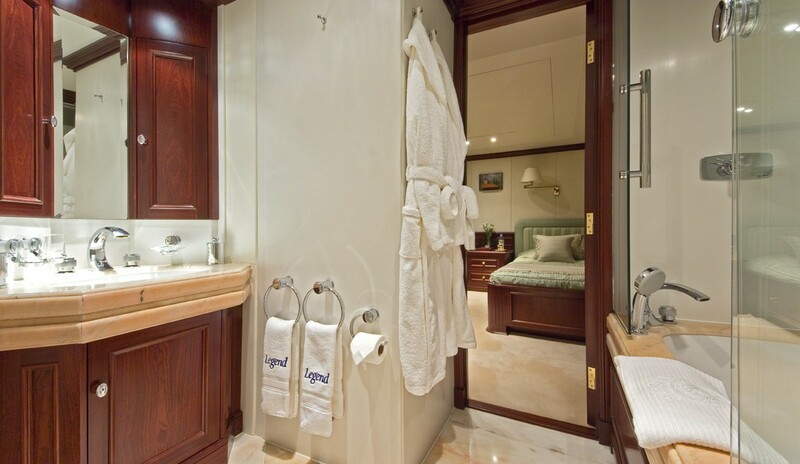 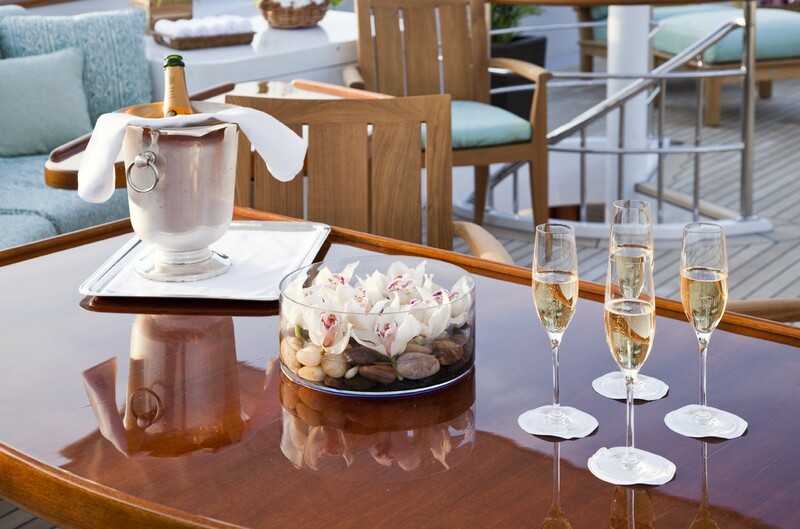 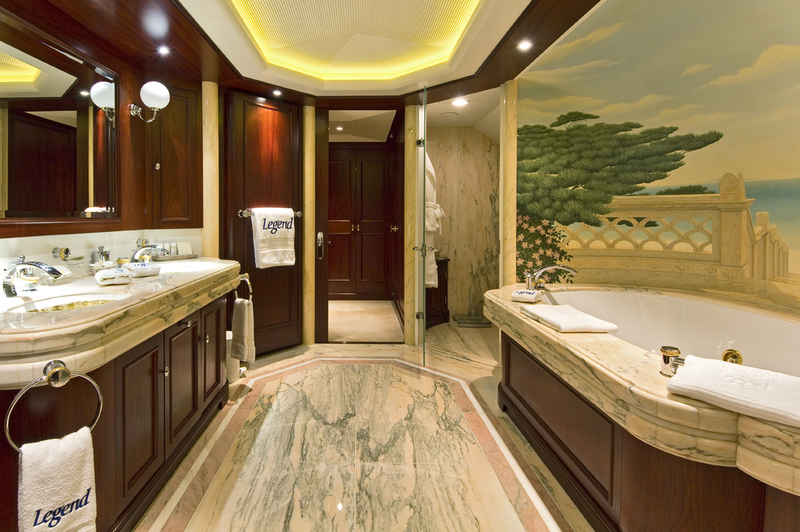 Built-in 1989 LEGEND ex Jamaica Bay underwent a total refit in 1999, 2007 and 2010-11. 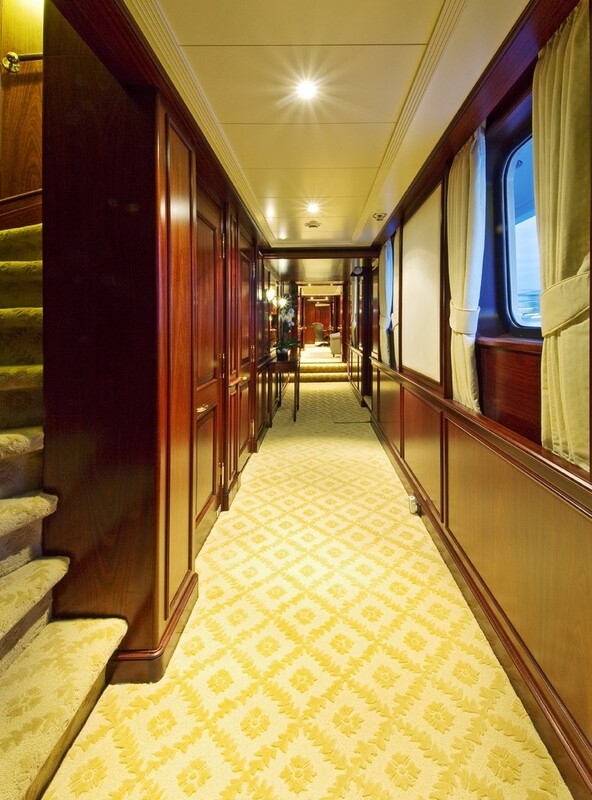 The latest 2010-11 refit was very comprehensive and included a complete interior/exterior refit with new carpets and furnishings plus bedding etc as well as being fitted with new Quantum Zero Speed Stabilisers, and receiving new technology including an Apple TV system throughout the vessel. 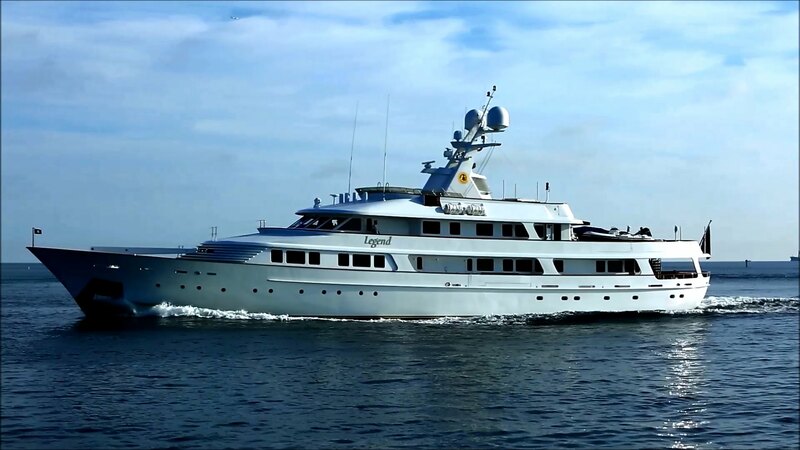 Yacht LEGEND also received several new tenders and water sports toys including a new Novurania 23 Chase tender with inboard diesel, a new Nautica 18’ widebody with outboard, two 4 stroke wet bikes, a selection of towables and toys plus Dive compressors and dive equipment. 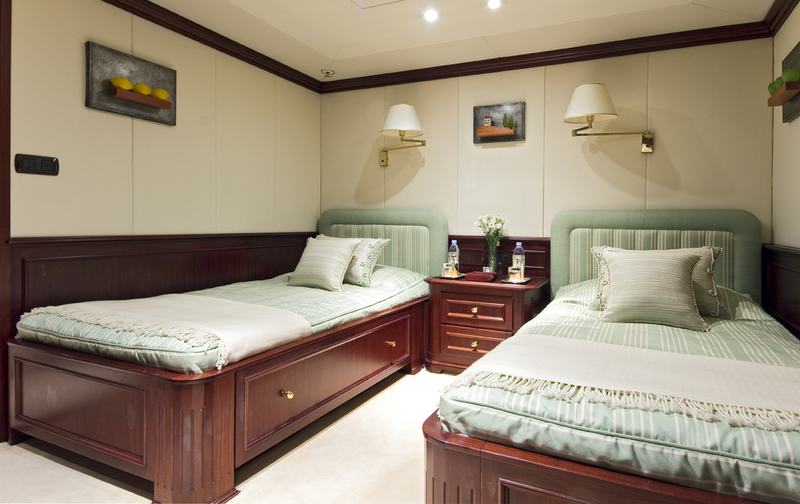 The yacht can accommodate 12 guests in 6 cabins with 4 Double and 2 Twin beds. 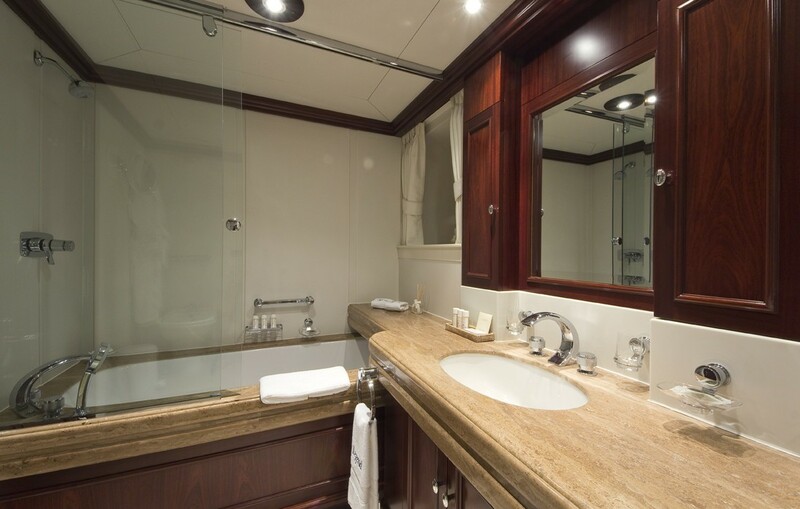 Air-conditioned accommodation is for twelve in two full-width staterooms, with en-suite bathrooms (one including Spa Pool) two spacious cabins with queen sized beds and two twin cabins all equipped with television and stereo and with their en suite bathroom facilities. 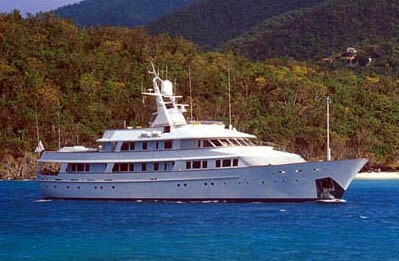 Motor yacht LEGEND has the following Tenders & Toys: New Novurania 23 Chase tender with inboard diesel New Nautica 18’ widebody with outboard 2 x 4 stroke wet bikes Selection of towables and toys Dive compressors and dive equipment Snorkelling equipment Waterskis Audio Visual Equipment and Deck Facilities Flat Screens throughout Apple TV system onboard 3D TV in the Sky Lounge Communications Satcoms (4) Cellular phones GSM Faxes Sat TV All navigational and operating electronics.